When midnight hits, you will be ready to party with the Silver Midnight New Year's Eve party kit! 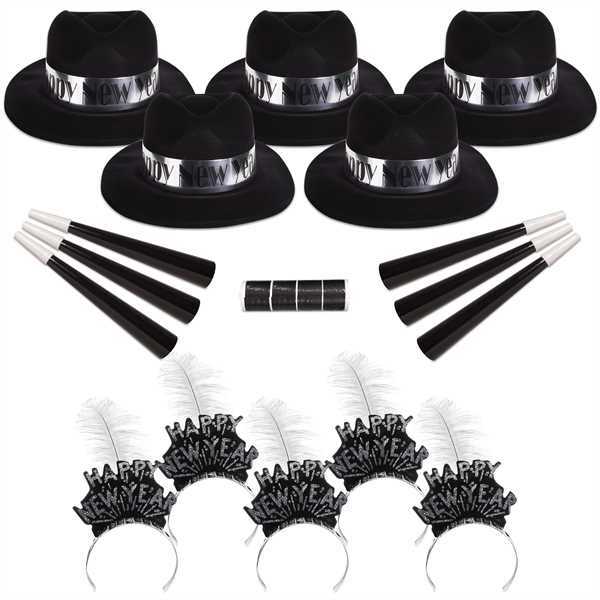 Designed for 50 people, this essential party starter includes 25 black fedoras with silver "Happy New Year" band accents, 25 "Happy New Year" tiaras with plume feather accents, 50 black metallic horns and 200 serpentine throws. This unimprinted party collection is the ideal way to create a large party with all of the fixings in a snap. Add some color, excitement and convenience to your next event with this kit today!